Christopher Martin is an emerging writer deeply influenced by the varied landscapes and ecologies of his home state of Georgia and the greater Southeast. 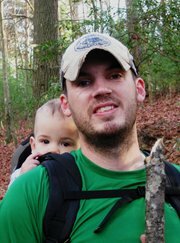 He lives with his wife and their two children in an old house between Red Top Mountain and Kennesaw Mountain in the northwest Georgia piedmont, where he is pursuing an MA in Professional Writing at Kennesaw State University. Chrisâ€™s first poetry chapbook, A Conference of Birds, was published by New Native Press in early 2012. His work has appeared or is forthcoming in Shambhala Sun, Ruminate Magazine, Drafthorse, Still: The Journal, Buddhist Poetry Review, New Southerner, Loose Change Literary Magazine, Revolution House, American Public Media's On Being blog, and the Elevate/Art Above Underground project in Atlanta. His poems â€œRevelation on the Cherokee County Lineâ€� and â€œAntidote Narcissusâ€� were recently selected to appear in the Southern Poetry Anthology, Volume V: Georgia, due out fall 2012 with Texas Review Press. "Antidote to Narcissus" was named an honorable mention by Naomi Shihab Nye for Ruminate Magazine's 2011 Janet McCabe Poetry Prize. With a few friends and colleagues, Chris edits the online literary magazine Flycatcher: A Journal of Native Imagination. Some of his works-in-progress include a collection of essays titled Native Moments: An Ecology of Fatherhood, a poetry chapbook about the environs and spiritual topography of Kennesaw Mountain, a poetry chapbook about the sacred and mundane aspects of fatherhood called The Book of Jethro, and a childrenâ€™s novel set on the southern half of the Appalachian Trail. I write as an expression of belonging to the world. Iâ€™ve always found joy in natureâ€”whether in the Blue Ridge Mountains, the Chattahoochee River, the stars, the smallest salamander beneath a rock, the gray spider between the window panes in my kitchen, the wrens and warblers that visit my feeder. All these things belong, content in their places, impervious to the notion that paradise awaits elsewhere. I felt this kind of belonging soon after my son was born, when he took hold of my thumb for the first time and wouldnâ€™t let go, and felt it again when my daughter was born and did the same. To belong is to love that which surrounds us, to partake in its native goodness, and to know that we, too, are loved and that we are good by the same measure: That is what I want to impart to my children. That is what I want to remember myself. And that is why I write.